Premium-quality magazines are manufactured to precise specifications for reliable fit and function in Caspian high capacity 1911 Autos. Provides increased firepower with fewer mag changes. 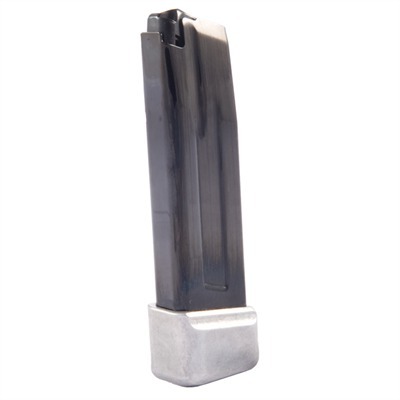 Rigid, smooth-welded, polished steel body for slick feeding and positive magwell fit. High-impact nylon follower is shaped to help ensure reliable feeding. Machined aluminum base pad removes easily for cleaning. Quick Change (Q.C.) model has an extended base pad that boosts the round count and is easy to grasp for fast mag changes in competition. Tactical model has a low-profile, matte black base pad that doesn't protrude from mag well. Mfg: Caspian SPECS: Steel body, blued; aluminum base pad, anodized, natural silver finish (Q.C.) or matte black (Tactical); nylon follower, black.